Blair Latoff Holmes, the executive director of media relations at the US Chamber of Commerce, sent Business Insider a photo of the moment Sen. Mitch McConnell (R-Kentucky) found out Republicans would take control of the US Senate. McConnell, stoic as always but holding up his arm in triumph, had just found out he would be the next majority leader. 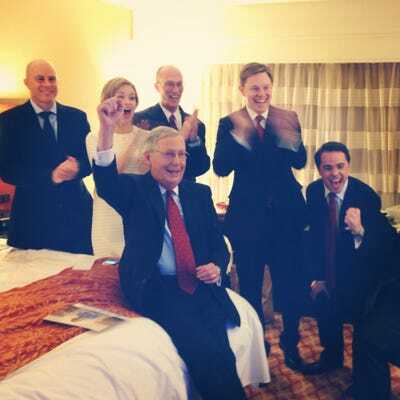 The photo was taken in the McConnell campaign’s room at the Marriott East in Louisville, the site of his victory party. From left to right: former chief of staff Kyle Simmons, scheduler Stefanie Muchow, senior adviser Terry Carmack, senior communications adviser John Ashbrook, and campaign manager Josh Holmes.